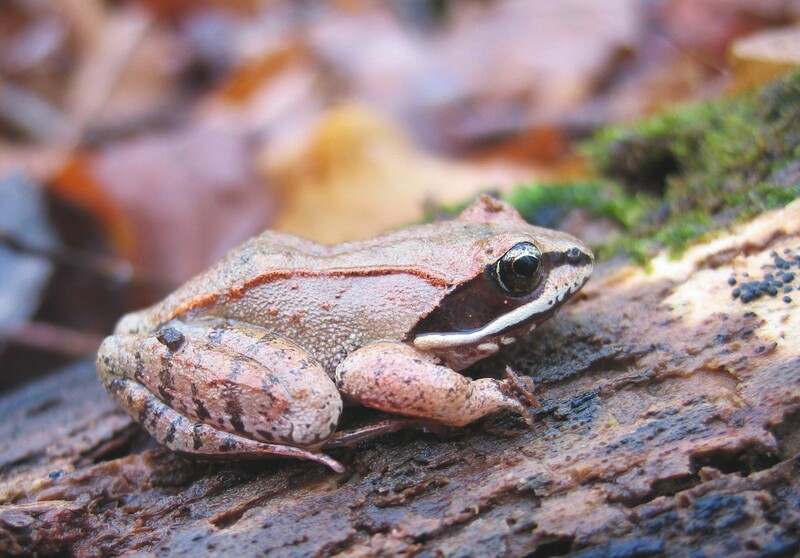 Where are Ohio's Vernal Pool Amphibians in Winter? It is winter, very cold, and snow covers the ground. 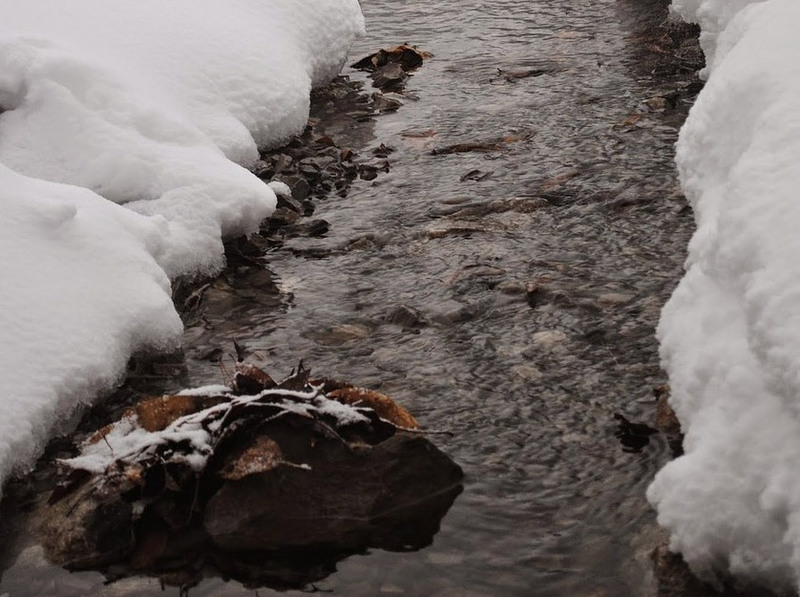 Ice is on lakes, streams, ponds, and wetlands, including vernal pools. Amphibians are ectotherms and cannot regulate their body temperatures but are reliant on the temperatures of their environments. So how are the vernal pool amphibians that will be using wetlands as breeding sites within the next few months spending their winter? Ohio vernal pool amphibians start breeding as early as late January to early February in some years in southern Ohio counties. However, we see most years that vernal pool amphibians in southern and central Ohio start their breeding in late February or March with populations in northern Ohio breeding in late March to early April. Where and how amphibians are able to survive the winter to make it to their late winter/spring breeding pools can vary by species. Many have developed unique adaptions to the demands presented by winters in Ohio. Some amphibian species spend the winter underwater in vernal pools and other aquatic resources, below the surface ice. This is true for the leopard frog, Lithobates pipiens, American bullfrog, L. catesbeianus, and green frog, L. clamitans. Within these aquatic resources, they lie on top of the pool bottom or bury themselves partially in the substrates. In the case of the American bullfrog and green frog, this can include their tadpoles. While their metabolism slows down significantly, the frogs and tadpoles can be seen moving around at times even under the ice. These species are able to remove enough oxygen from the water through their skin to remain alive. While pond, pool, or lake ice will be at 32o F, the water at the bottom is less cold and can range from the 35oF to 40o F, warm enough to avoid their bodies freezing. The red-spotted newt, Notophothalmus viridescens viridescens is the only Ohio species in the Family Salamandridae. Adults of this species also prefer spending the winter in permanent ponds. Although they become less active, they will still feed and at times can be seen moving across the substrates and swimming in the water below the ice. 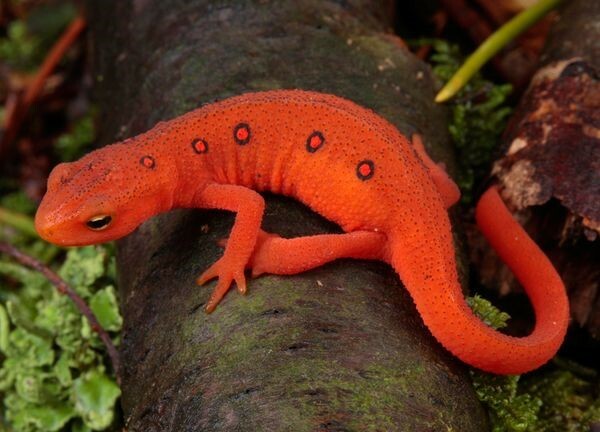 The Red Eft is the immature and terrestrial form of the Red-spotted Newt and is a bright, vibrant orange color with red spots. It remains a terrestrial juvenile for three to seven years before it migrates to a lake, pond, or wetland and metamorphoses into an aquatic adult. Along with Red-spotted Newt adults whose aquatic habitats have dried up in the fall, the Red Efts endure the winter months by seeking refuge under rocks, logs, leaf litter, natural crevices below ground, or other locations where they can avoid freezing temperatures. The Four-toed Salamander, Hemidactylium scutatum is the only one of the 13 Ohio species in the family Plenthodontidae to breed in vernal pools. It is named the four-toed salamander because it has only four toes on its hind feet while all other Ohio salamander species have five toes. 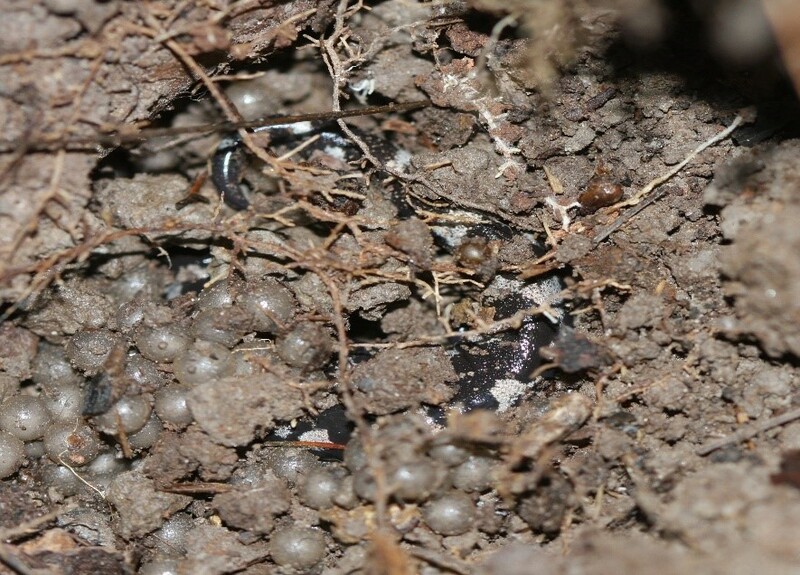 Unlike other Ohio amphibian species, Four-toed Salamanders mate in the late summer or fall and the gravid females (those carrying eggs) travel to vernal pools in the spring to deposit and guard their eggs until they hatch. As with the two terrestrial stages of the Red-Spotted Newt, the Four-toed Salamander spends the winter in subsurface retreats. Most of the salamanders in the family Ambystomatidae are vernal pool breeders. 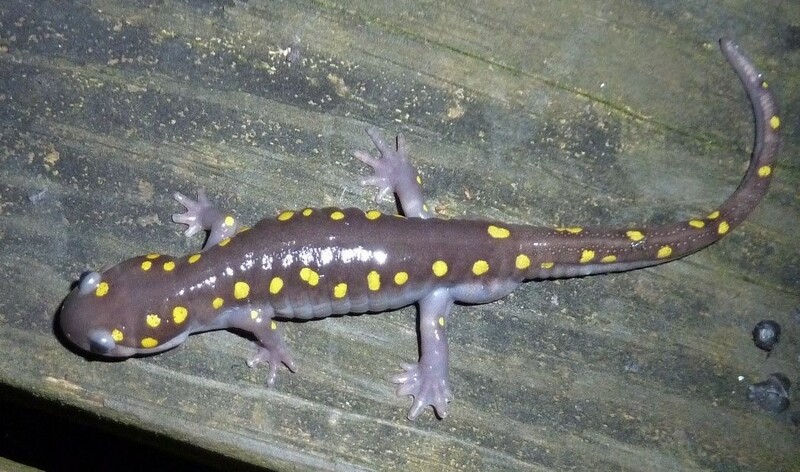 These species include the Jefferson salamander, Ambystoma jeffersoinanum, blue-spotted salamander, A. laterale, spotted salamander, A. maculatum, marbled salamander, A. opacum, small-mouthed salamander, A. texanum, eastern tiger salamander, A. tigrinum, and the unisexual Ambystoma (hybrids). These species are largely fossorial, meaning they spend a significant portion (70 to 95%) of their lives underground, and why they are also known as mole salamanders. Most of the mole salamander species in this family use the abandoned burrows of small mammals or crayfish rather than digging their own. However, the eastern tiger salamander, Ohio’s largest terrestrial salamander, is a proficient digger and creates its own burrows and tunnels. Some of these excavations are as deep as 1.3 meters and other mole salamander species will use burrows that are up to one meter in depth. Passing wintertime at these depths keeps them below the frost line and warm enough to make it to the next breeding season. These species do not eat during winter. Instead, they rely on their accumulated fat reserves to meet the minimal energy requirements demanded for low temperature existence. In fact, these Ambystomatid species do not eat until after they have bred in the spring. The only exception is the marbled salamander. This species mates and lays its eggs in vernal pools in the late summer or fall when the pools are dry. 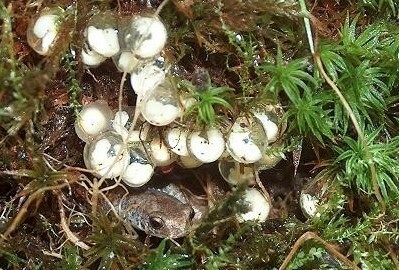 The females guard their eggs until the seasonal water levels from fall rains inundate the eggs. The females then return to their terrestrial habitats content that their clutch of eggs has started its transformation to aquatic larvae. During the winter within the vernal pools used for breeding the larvae are often seen below the surface ice swimming through the cold pool water. The American toad, Anaxyrus americanus and Fowler’s toad, A. fowerli, are also adapted to be excavators and construct burrows in the fall deep enough to keep them at temperatures above freezing. The highly fossorial eastern spadefoot, Scaphiopus holbrookii, is a state endangered species. Its range is the sandy floodplains of large rivers within the Ohio River watershed. This toad is Ohio’s fastest and most efficient digger among the amphibian species and can develop a sand capped burrow below the frost line within a very short time. The wood frog, Lithobates sylvaticus, spring peeper, Pseudacris crucifer, western chorus frog, P. triseriata, mountain chorus frog, P. brachyphona, gray treefrog, Hyla versicolor, and Cope’s gray treefrog, H. chrysoscelis are not adapted to digging. Instead, they seek deep crevices in logs and rocks or tunnel down into the leaf litter. These practices often expose them to below freezing temperatures. However, they do not die. They have antifreeze, in the form of a high concentration of glucose in their vital organs that prevents freezing. A partially frozen frog will stop breathing and its heart will stop beating. When their hibernaculum warms up, the frogs’ frozen body parts will thaw and their lungs and heart will resume function. This revival makes it appear as though these individuals have risen from the dead. The adaptations of this diverse group of animals has enabled them to survive through extreme winter conditions. This winter when your home seems somewhat cold and you wonder if someone has been fooling around with the thermostat, remember it could be a lot worse.